Happy Birthday: Yes, something so simple works very well. Birthday emails have a 481 percent higher transaction rate than purely promotional emails. Location: Knowing where someone lives or is planning on going can significantly help niche your audience. 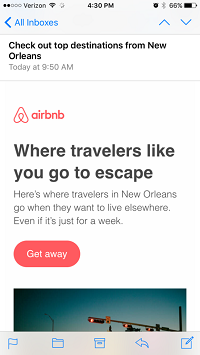 The Airbnb screenshot below, which temps me with a quick getaway, shows that they are targeting me because I am from New Orleans. Hmm… where to go? Weather: Depending on the season or weather pattern in an area, you can promote certain services or products. If you have a home improvement or construction company and are in the midst of hurricane season, you can send out an email about protecting homes from storm damage. Language: Use language like you, yours and ours in your emails. This makes everything a bit more personal and makes the user feel as though you know them. Another way to personalize your language is to utilize demographics. By understanding and addressing someone based on their demographic information, your email can seem more casual, as if you’re speaking to someone you know. For example, you can use “wicked” in Boston, “y’all” in the South or “bodega” in NYC. 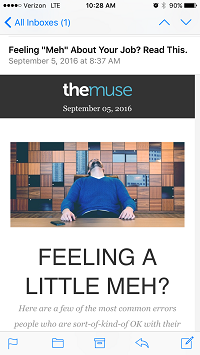 In the example below, the Muse using language that targets my age demographic. “Meh” is a term my generation frequently uses. Questions: Asking legitimate questions in the headline is actually a great way for you and the consumer to get what you want. Don’t be scared to ask your audience the questions you want answered, like what services interest them. Asking a question is an easy way to get data on consumers, allowing you to tailor your future emails to them more accurately. How are you personalizing your emails? Tweet us @DEVENEYMKTG and let us know your tips!